You're forgetting syllabic values. "Be" is written simply as ��, and "ye" is written ��. Also, don't forget that ALL capitalization and punctuation conventions of Deseret are identical to English's. So the word �� is always capitalized. Also, do you pronounce "of" [ɔv] or [ɒv]? You spell it both ways in this text, and you should be consistent. I pronounce it [ʌv] and spell it ����. @Anonymous: The standard American pronunciation of 'of' is actually /av/ when stressed, which it rarely is, and /ǝv/~/ǝ/ when unstressed. 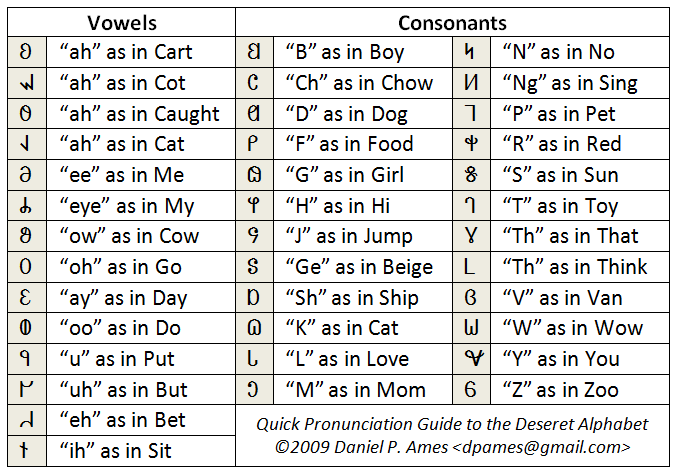 In very recent times (perhaps last 50-75 years), many Americans have failed to learn the more historically correct stressed form and have reanalyzed the unstressed from as a variant of /ʌv/, a stressed pronunciation which is not really standard. In the UK, the standard stressed from of 'of' is /ɒv/, though its unstressed forms are identical to those of the US. In neither nation is it possible to say /ɔv/--it just doesn't exist as a pronunciation! As I recommended in my booklet, the most correct way to spell 'of' in the DA for present-day Americans would be /av/ ����, though the vulgar stressed version /ʌv/ ���� would be understandable.